This page is based on information gleaned from a day working with the Stewards of the machine, and from articles published in Ringing World (in 1950) and Model Engineer (in 1925). The diagrams are based on those used in the Ringing World articles, which was produced by Brian Price. The requirements for a change-ringing machine are to be able to ring a group of bells in sequence, and to be able to change that sequence in accordance to the rules of English bell ringing traditions. If you don't understand some of the references to the ringing, in particular the notation used, you may find this page helpful. It contains a brief summary of terms used and describes the notation. If, having read that and come back here, you still don't follow, please feel free to contact me by e-mail (bill 'at' billp.org) and I'll try to clarify further. The Carter machine, as it is now, represents the culmination of 35 years of development. During this period the mechanism for striking the bells changed somewhat; early versions used a machanical striking mechanism, with a group of bowl-shaped bells mounted above the machine. It appears that the sound of this was not satisfactory and Carter replaced this with an electrical arrangement and connected up a group of what appear to be handbells, but with a striker operated by electromagnet for each bell. The machine, therefore outputs electrical pulses over twelve wires to this arrangement. In order to strike the bells in sequence, the machine has a distributor. This consists of a paxolin panel with rings of brass studs, arranged in rings of 5, 6, 7, 8, 10, 12 so that peals can be rung on groups of these many of the bells. In fact, the rings contain twice the above numbers, one revolution being equivalent to a backstroke followed by a handstroke. A slightly larger gap gives a slight pause between the pairs of rows. The distributor, therefore, produces a series of short pulses on a subset of the 12 wires which are connected to the studs. In order to get the bells to ring in different sequences a switching arrangement is provided which can connect any of the bells to any of these wires. Brian Price used a diagram like this to illustrate the idea. This is actually quite different in layout to that used on the Carter Machine, but illustrates the general principle. In this diagram the bars A, B, C and D are connected to the distributor, while bars E, F, G and H are connected to the bells. Springy brass sliders J, K, L and M make connections between the two sets of bars. Provided each slider connects a different pair of bars, the bells will operate in some order depending on the positions of the sliders. In the position shown in the diagram the order will be E, G, F and H.
In the carter machine the strips of springy brass are replaced by steel bars (A) mounted in a frame (B). Each one represents a bell and are therefore known as 'bell-plates'. Each bell-plate has a pillar (E) on the top of which are two contacts (G). This drawing shows one of the bell-plates, looking down at an angle. Above the bell-plates, which are mounted across the frame, there is a longitudinal panel which has twelve contact wires (H) along its length, and twelve transverse bars (F). The mushroom-shaped contact runs across the wires, while the stud-shaped contact runs along the bars. This drawing shows the contacts viewed from below: The longitudinal wires carry the current from the distributor and the transverse bars are connected, by wires above the panel, to the bells. The two contacts (G) are sprung inside the pillar and are also connected together, thereby providing the connection between the distributor and the bells. The bell-plates (A) can slide across the frame, but each is gripped by a springy clamp (C) which prevents unintentional movement. The edges of the plate are serrated with twelve notches for each of the positions that the bell can hold. The twelve positions that the plate can assume correspond to the places in a row that the bell can take up. On the underside of each bell-plate, there are two oddly-shaped levers (L). The pre-selection bars (J) have small lugs (K) on the upper side. These can engage with the levers, and as the rod moves forward, the lever tilts and pushes the plate sideways. 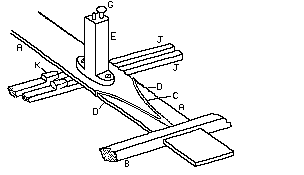 A spring (N) causes the levers to return to the normal position when the pre-selection rod returns to its home position. It will be noticed that only one of these levers should engage with a rod, otherwise the mechanism will jam! All of the above are contained within a rigid frame that is removeable. This provides access to the mechanisms below which we come to below. If you look at the photographs of the machine, several of these have this upper section removed. To summarise the above: we have a switching mechanism that, in any of the valid positions, will produce a sequence of strikes, in some order for every half-revolution of the distributor. A series of pre-selection rods, running the length of the upper frame, can cause any two adjacent bells to change places. These rods are identified by the positions that they control, thus rod 1-2 causes the bells in first and second place to swap, 2-3 the bells in second and third place, and so on down to 11-12. It will be seen that eleven rods are sufficient to control the twelve bells. The only constraint is that two adjacent rods must never operate at the same time! During setting up of the machine, the bell-plates can be moved by hand. It is obviously important to ensure that each plate holds its correct position before starting, otherwise the sequence will be incorrect. The lower part of the machine is concerned with controlling the sequences of strikes for each row. The machine is operated by an electric motor in the box which acts as a stand for the machine. In addition to the motor, there is a speed control mechanism, and a transformer and rectifier to provide electrical power to operate the bells. Power is transmitted from the base to the lower frame via cog-wheels. The wheel on the main spindle is fitted with a friction clutch so that, in the event of the mechanism jamming, the clutch will slip and avoid damage to the more delicate parts of the mechanism. The main shaft passes through the centre of a 'squirrel cage' drum which consists of four disks (E), and thirteen rods. Twelve of these rods can move a short distance from side-to-side and carry cams (D) and pins(H). The other rod is fixed and carries twelve further pins (F). Above the drum are 11 actuator rods (A), which are driven in a back-and-forwards manner by eccentrics (B) and return levers (C). 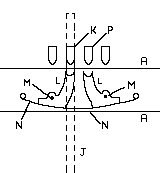 At the end of each actuating lever is a peg which can engage in a slot in the bottom of the pre-selection levers (J). This will only happen, however, if the actuator rod is lifted by the cam at the appropriate position in the cycle. Normally, the cams lie in between the actuating rods and do not lift them. If the bell-plates are in the normal starting position, the bells will ring rounds. In order for changes to be rung, the appropriate cams must be moved under the corresponding actuating rods before the drum reaches the position where the rods need to be lifted. This is achieved by the control mechanism. This consists of two boxes (A) of programming pegs (B), levers (C) and rotating scoops (G). If the lever C is pressed down by a peg, it pulls down on the cross-bar (E), which rotates shaft (F) and the scoop (G). When the pin on the shaft (J) passes the scoop, it will be moved left or right depending upon which way the scoop has been rotated. The programming box is simply a frame to hold 15 rows of 6 programming pegs. These pegs are pivoted about a centre point and can be either vertical, inclined left or inclined right. In the vertical position they do not engage with any of the levers, if they are inclined to one side, they engage the appropriate lever when the box is lowered. By moving the box to an appropriate position, any one of the rows of pegs can be caused to line up with the levers, thus allowing the operator to provide 15 different combinations. One point which has perhaps not been stressed so far is that there are two programming boxes, two sets of levers, etc. The front mechanisms are used to control the backstroke, while the rear mechanisms control the handstroke. This means that there are thirty different combinations possible, but with restrictions to which stroke they are applied. Finally, we move on to discuss how these combinations are selected. At the opposite end of the machine from the programming boxes, there are two drums, again, one for backstroke, the other for handstroke. These consist of circular frames (F), surrounded by a series of sequence bars (H). The bars are held within the frames, but can move laterally, but are restrained by a spring (not shown) which surrounds them and so prevents unintentional movement. These bars are moved to appropriate positions during the setting-up of the machine. The drums rotate slightly after each round has occurred, bringing a different bar to the top. A curiously-shaped lever (Q), operated by a cam (J) on the main shaft, rises until it is prevented from going further by coming into contact with the current bar. The lower end of the lever engages in a ratchet at the bottom of lever (L) and prevents its complete return. The position at which this happens is therefore controlled by the position of the corresponding sequence bar. Linked to level (L) is a long bar (M) which engages with a stud projecting from the programming box (A). The box in turn slides along lever (B) which, via a pivot at (D) is operated by another cam (E) on the main shaft. The programming box, therefore lifts up and down and slides out along (B) as the cams (J) and (E) rotate. Provided the sequence bars have been positioned correctly, the programming box will depress the selected control levers, operate the sliding rods, the cams (D) on these rods will lift the actuating bars, which will cause the specifed changes to be made. Each of the programming drums is mounted on a shaft which, as has already been stated, rotates slightly for each row of the peal. This is achieved by a ratchet, also operated by a cam on the main shaft. Each shaft has a control dial, which can be set to any number from 0 to 48. When the drum has rotated by the number selected a release is triggered and the drum spins back under pressure from a spring to the zero position. Thus the machine can cycle through the prescribed sequence of changes, then repeat them. This takes care of the large proportion of the changes. In order to complete a peal, however requires additional changes. These are produced manually by a two buttons provided. These cause the programming box to select two additional changes at these points. The machine passed into care of the Central Council of Church Bell Ringers after the death of Mr Carter in 1927. It has had several 'homes' over the intervening years, but is now held in the Museum at the John Taylor Bell Foundry in Loughborough. Because of the complex nature of the machine, it is only run a few times each year. Contact the Foundry Museum for details of when the next such demonstration will take place. The machine can be seen statically whenever the Museum is open - again see their website for details of opening hours. I owe a big thank-you to Alan Bagworth and John Anderson, the then Stewards of the machine, for inviting me to join them as they prepared the machine for a demonstration. Also to Bob Bracegirdle, the Museum Curator, for providing initial information. I also owe a debt to Brian Price, for the articles he wrote in Ringing World in 1950, which have provided me with a reference description to base this page upon.